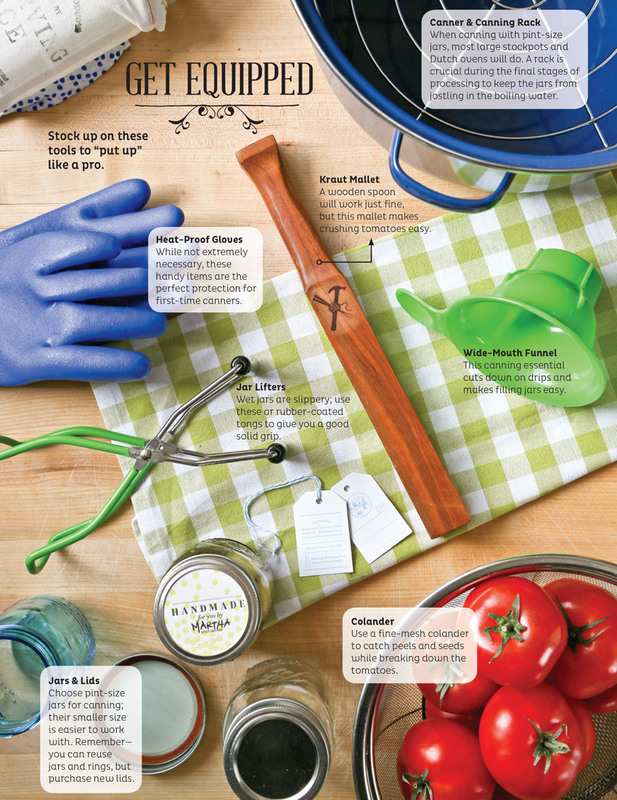 The first of August marks International Can-It-Forward Day, a celebration of the joys of fresh canning. We can’t think of a better way to join in the festivities than to preserve those rubies of the South—ripe summer tomatoes. For many of us, however, “putting up” is a thing of the past—the handiwork of our mothers and grandmothers. They filled their kitchens (and our memories) with the sounds of jostling jars, rattling pot lids, and the jack-in-the-box pops of perfect seals as they hurried to preserve summer’s bounty before winter transformed it into memory. But their hallowed craft is no lost art; it’s simply a skill waiting to be learned. We visited Preserving Place in Atlanta, Georgia, where owner Martha McMillin walked us step-by-step through putting up tomatoes. Follow along, and learn how to reclaim this treasured pastime. In a large stockpot or canner, fill with water to three-fourths full. Set jars in pot, submerging to sit flat. Add water to within 2 inches of rim of pot. Bring to a boil over high heat. Cover, and reduce heat to medium. Keep jars warm. Boiling water is too hot for jar lids; it can compromise the rubber seal. Heat lids in a small saucepan of barely simmering water for 10 minutes. In a large Dutch oven, fill with water to halfway full. Bring to a boil over high heat. Fill a large bowl halfway full with ice water. Cut a small X in the end of each tomato. 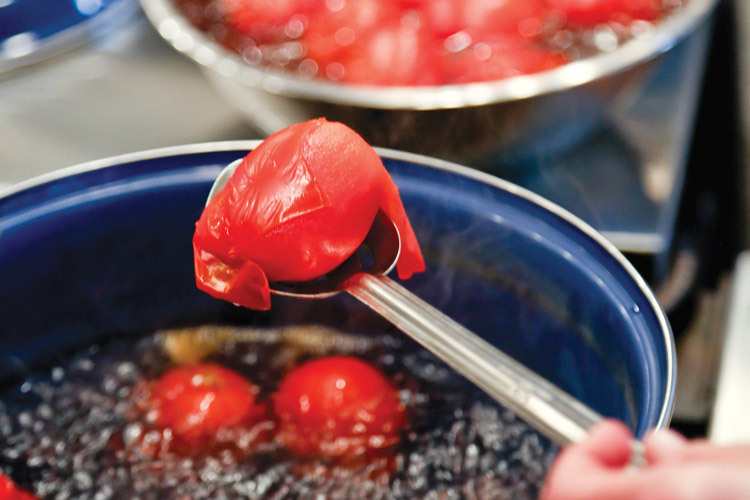 Add tomatoes to boiling water; cook until peels begin to pull away, 30 seconds to 1 minute. 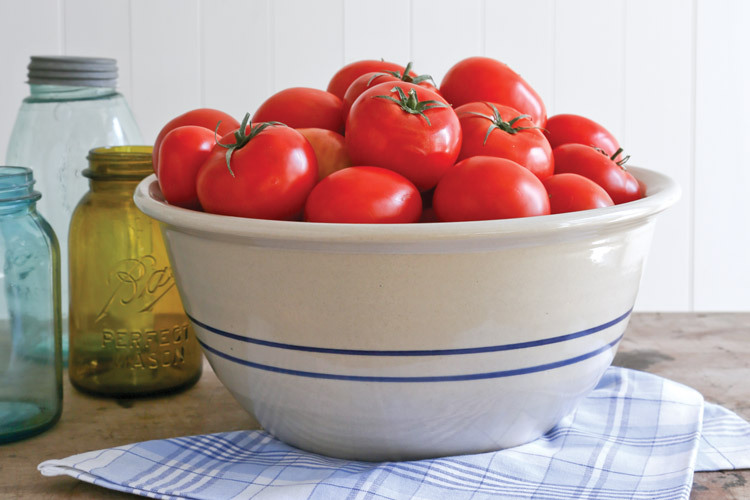 Using a slotted spoon, transfer tomatoes to ice water. Let cool 1 to 2 minutes. Quickly remove tomatoes from ice water. Place a colander over a large bowl. 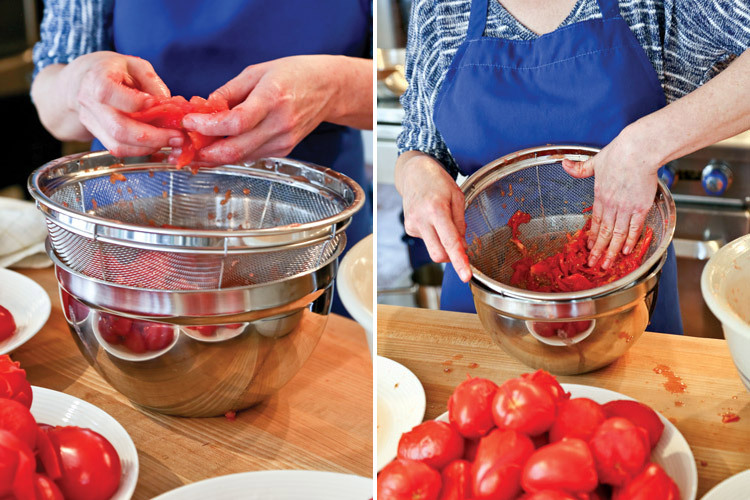 Peel tomatoes over colander, breaking open with your fingers to remove as many seeds as possible. Place seeded peeled tomato pieces in another large bowl. Press solids against side of colander to extract juice; discard peels and seeds. Reserve juice. Refrigerate the juice up to 2 weeks, or process it separately. 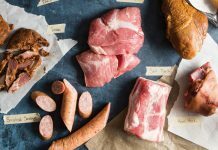 It’s perfect for soups, sauces, and Bloody Marys.